Destroyer capsules are advanced and expensive capsules that, when thrown with the left mouse button, spawn five powerful Destroyer robots. The Destroyer robots have infinite laser energy and will follow the player, attacking any enemies that come within range, until they run out of health or their lifespans elapse. Have 100 combat robots or more following you. Follower robots will only loosely follow the player and are subject to inertia. This allows the player to 'swing' packs of defender/destroyer robots into enemy bases to damage enemy structures with less risk to himself. Launching distractor capsules into the enemy base beforehand, as well as using the speed of the car or exoskeleton can further reduce damage to the player. 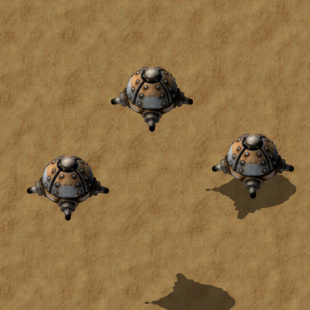 Destroyers being spawned and following the player. The maximum number of active Destroyer robots is limited by the follower robot count (research). While using follower robots, the number of robots in use will be visible in an icon to the right of the quick-bar. Hovering over the icon with the cursor will show the types of robots and the currently researched maximum. This page was last edited on 11 April 2019, at 03:21.